It was time. I knew from the beginning of the summer that this was the year I was going to set out to do my first solo trip. Its funny that I had never done one before but I think I have just been lucky to have lots of good friends who also love camping! I have been on many trips and was confident I had the skills required to complete a solo trip, but it was the daunting thought of what it would be like to be alone in the woods that had held me back. Most of the summer had passed and it was nearing September, which happened to also be the month that I would be turning 25. Friends asking what I wanted to do for my birthday this year might have been a little taken back when I expressed my interest in spending my 25th birthday alone in the woods, however, I think many campers will understand how exciting this was for me. The week before I was stressing out trying to find the perfect route for me to do this trip on. Kawartha Highlands was one of my ideas however the number of cottages and short distances of most of the routes was really not selling me for this weekend. Even though I do still want to do a trip there. I happened to flip through my copy of Kevin Callan’s Top 50 Canoe Routes of Ontario and stumbled upon the Nellie Lake Loop. 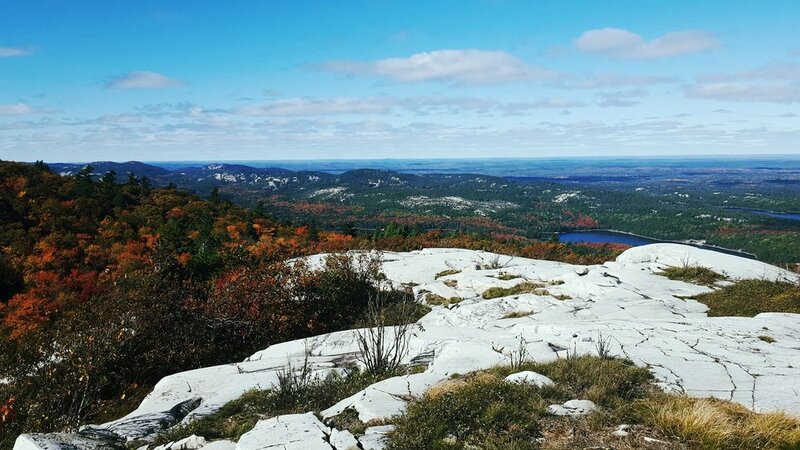 Total distance of 28km, 4 portages (3 being over 1.5km in length), a recommended time of 2-3 days, and located in the heart of the La Cloche mountain range…I was sold. It was the perfect route for this occasion. It was challenging yet I was confident that I could accomplish it. I drove up late on Thursday night after having a birthday beer with a friend who has a birthday 3 days before mine. Hitting the road at 8pm with a 5 hour drive ahead of me, I had mixed feelings of nerves and excitement. This was one of the first times that I really had the feeling of being alone, while having no one to talk to on the drive up. I arrived at the Widgawa Lodge around 1am. I had packed a beer to have once I arrived and I sat on the hood my car looking at the insane number of stars that you could see in the sky that night. As I had all my gear on one seat in my car and an empty trunk, I opted to fold down the other two back seats of my car and sleep in my trunk. Surprisingly more comfortable that you would think! I was up at 7:30am so that I could drive down to the launch and be ready for 8am when the lodge opened. I apparently got lucky with booking the week before as normally Grace Lake is booked months in advance but someone had canceled last minute. I picked up my permit and launched my canoe on the river leading to Charlton Lake. The river was actually an awesome start to the trip. This would have been the second time I got the feeling of being alone. Each paddle stroke of mine being the only thing propelling the canoe forward. I was alone. My paddle up Charlton Lake started with a mild headwind giving me a small taste of what was yet to come later in the trip. I was trolling a spoon as I usually do to see if I can catch any fish while on route to the first portage. There were a few cottages on Charlton Lake but as I got into Frood Lake there were less and less until I got to the portage where there were no cottages. I arrived at the first portage at the end of Cranberry Bay for 1:10pm as I had taken my time on my way there. Mountains surround the final stretch of Cranberry Bay and you could start to see what the terrain was going to be like up ahead. It was a little daunting as the first portage was 1.7km and it looked like it was going to be uphill. I started the portage at 1:20pm carrying everything on my back with my canoe on my shoulders. This portage marks a point about halfway where you officially enter into Killarney Provincial Park. I was told that there was a dead moose on this portage but there was no sight of him when I walked the portage. Likely removed by other animals at this point. I was able to do the portage all in 1 run, but had to take about 5 breaks on the way as all the weight was on my shoulders. I still managed to get to the other side by 2pm completing the 1.7km uphill portage in around 40 minutes. The view on the other side of this portage was an instant reward for the long climb up. Grace Lake is completely surrounded by mountains and it was breath taking. I started paddling along the left shore weaving through the numerous small islands that also exist on this lake. 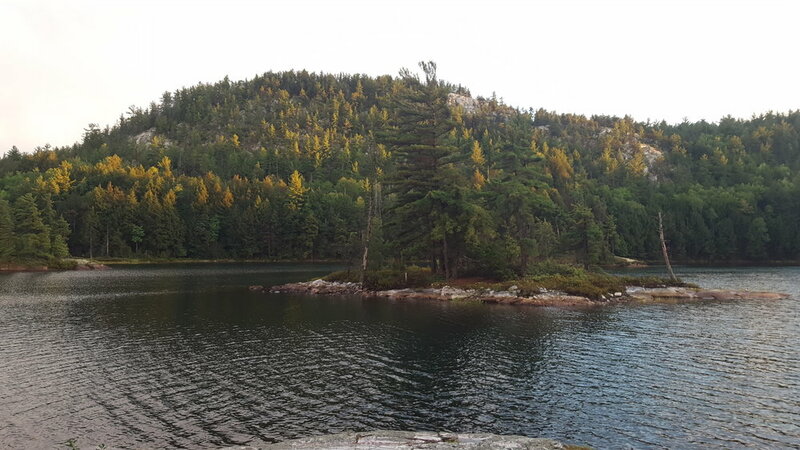 I ended up taking the second campsite that is on the left side of the lake (#179 on the Killarney Map). I was on my campsite by 2:30pm and due to the cloudy skies, spent the first hour setting up my camp so that it was rain proof. Once the tent and tarps were set I got a fire going, had an early dinner, and made myself a whisky chai tea (a new staple on my trips). Dinner tonight was a dehydrated meal I had purchased from Sail as I did not have time to dehydrate the meals myself. The winds were consistently strong but the clouds didn’t seem to be changing very much. There were odd drops of rain here and there but nothing heavy and by this time I had my camp locked and loaded preparing for the storm. I decided to take my chances at climbing one of the nearby mountains that was a short paddle west from my site along the same shore as the campsites. I started at the bottom of the rocky path up. 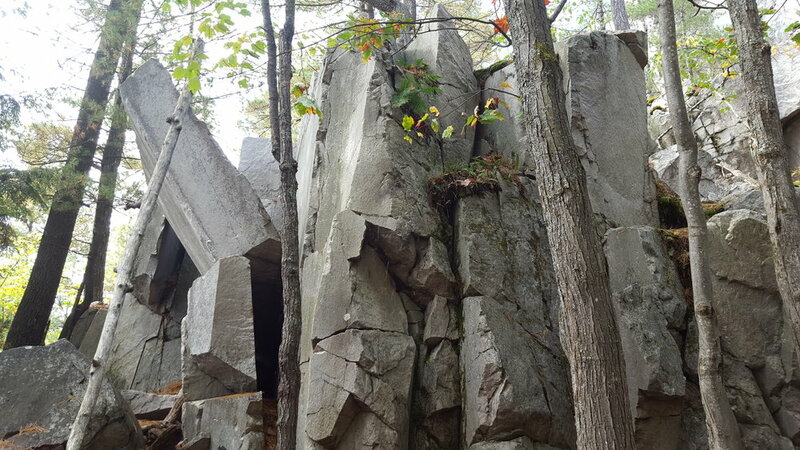 It seemed as though anything that looked like rock was actually quartzite and almost resembled soapstone. The quartz is slippery to walk on when it is wet but it is absolutely stunning to look at and climb. I slowly made my way up the mountain and it really only took me about 5-10 minutes to get to the top where the viewing point was incredible. Looking back you could see the mountain range lining Cranberry Bay where I had paddled earlier that day. This also included a view of the portage that I had done into Grace Lake, which really just looked like thick forest (below). Looking the opposite way was your view over Grace Lake. It was perfect even though it was cloudy. The entire lake was surrounded by mountains and had a system of islands that scattered the lake. I could have spent the entire day at the top so it was good that I had brought red wine with me! With winds picking up even more, I opted to climb down the mountain and get ready for the storm to hit. As I paddled back to my site the rain started falling down and there was a beautiful fog over the forest. Once I got to the site the rain had stopped and it actually for a moment looked like the skies might be clearing up. There was a unusual yellow colour to the clouds as they looked like they were going to clear. This was not the case. Before I knew it the winds picked up stronger than ever. That night was difficult to sleep due to the high winds whipping my tarp causing loud cracks every few minutes. I was up a little later than I wanted to be getting out of my tent around 8am. It was a little chilly still with a light breeze. I made some oatmeal and coffee, which I had while packing up my site. I left around 10am to paddle the last bit of Grace Lake to arrive at the portage to NellieLake. This was another long uphill portage. At a little over 2km in length, I knew this wasn’t going to be an easy one. I took all my gear in one shot again taking breaks along my way. This one seemed to me more uphill than the last. I managed to finish this portage in an hour and I met a nice couple on the other side and chatted with them for a short while before going our separate ways. Nellie Lake was beautiful. 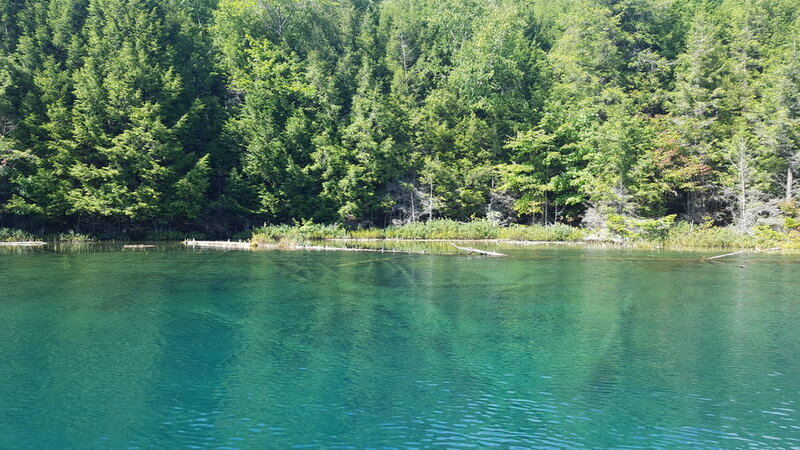 It was the brightest blue I had ever seen in a lake and it is apparently the clearest lake in Killarney being able to see the bottom in up to approximately 70ft of water. I only had a short paddle to get to the next portage. The sun had come out and I opted to use this as a chance to go for a quick swim before doing my last long portage of the trip into Murray Lake. This was supposed to be a portage that was primarily downhill which I was looking forward to, although apparently a steep downhill. Within a couple hundred meters of starting the portage, you could see the trees open up on the left of the trail and it looked like another spot to hike up a mountain. I used this as a resting point and left my gear at the side of the trail while I went for a quick hike. Again only taking about 5 minutes to get to a great viewing spot where you had a vantage point of Nellie Lake in one direction, and the other had a view of the portage that I was on which was lined with mountains. I continued the portage and eventually came across a waterfall on the right side of the portage. I once again used this as an opportunity to take a break. It looked like it might have more water passing through it earlier in the year, but as it was September the water levels were low. I continued along the portage until arriving at Murray Lake. I was very thankful to be going the direction I was, as the portage was a steep downhill climb and having to do it the other way would not have been fun. I took a look at the site that was closest to the portage but opted to go to the other side of the lake to save myself the paddle in the morning. I camped on site number (#212) and there was a nice large rock that went down the front of the site making it a great spot to swim. There were only 3 sites on the lake and they were all still available when I booked earlier that week. It was very clear once I was on the site that I was the only person on the lake. The silence was a little eerie at times but it was a cool feeling knowing I was completely alone. I set up camp and made some dinner. Again dinner was another dehydrated meal I had purchased but this was from a different brand than the last as I wanted to compare. They were both good meals considering they were dehydrated. After dinner I decided to go fishing quickly as it was getting darker. This was the first lake I was allowed to fish on since being on Charlton Lake. Once the canoe had all my gear in it, I realized I was missing my paddle. As it was calm out I decided to leave the canoe untied while I ran to get the paddle. This was a bit of a mistake. Upon my return after only a few seconds away, my canoe had floated about 20ft away from the shoreline. Without much hesitation I jumped into the water to swim after it, even though I had opted not to swim earlier as it was a little cooler out that night. After the swim I really only had a few minutes to get a couple of casts in. One of my first casts ended up bringing in a good size pike, which was lucky as I was not using a leader. After letting the fish go I called it on the fishing and packed it in for the night. I had a nice roaring fire going and sat around having some of the remaining wine while waiting for the stars to come out. Yet again the stars were out in full force and they lit the entire sky. I enjoyed them for a while before heading into the tent for the night. The winds were not blowing like the first night which made it completely silent on the lake. Once again a bit of a cool eerie feeling. I set my alarm to wake up early to not only catch sunrise but also because I wanted to make it home in good time today. I was out of bed for 6am and it was just as dark as when I went to bed. I used my headlamp to start packing up my tent and gear. By about 7am I was having breakfast watching the sunrise. My mom had given me a birthday cake (really just a protein brownie bar) and a candle so that I could celebrate my birthday still. It was a cool feeling knowing this was my first solo trip and I got to do it on my 25th birthday. Talk about a memorable birthday! I was on the water by about 8am. As I didn’t get much fishing in the day before, I wanted to ensure I got a few casts in on my way back to the launch. Turning the corner to go towards the river I started getting lots of hits. I pulled out 4 or 5 nice bass before continuing on my way. It was all catch and release at this point. I continued until reaching the 200m portage which was to be my very last portage of the trip. This was going to be a breeze after all the long portages I had already completed. The river was a beautiful paddle and there was not another person in sight. Shortly after the last portage I came across a log cabin that said “The Powers Cabin” but there was no one there. 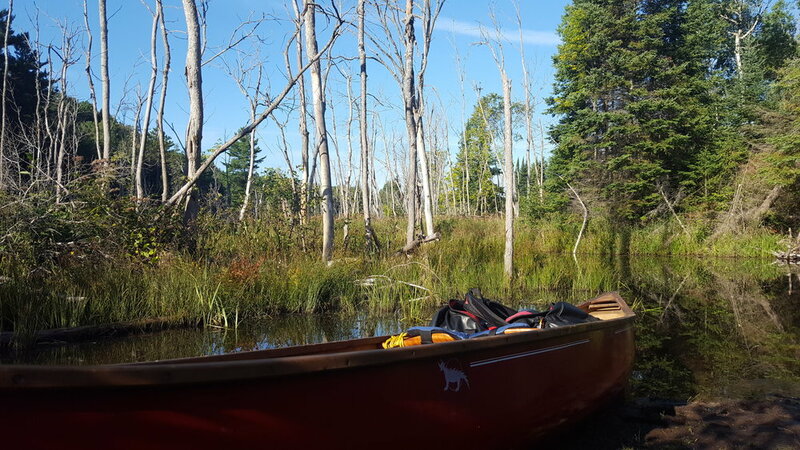 I continued my paddle until arriving at a beaver dam which had a very short portage going around it. Although I wouldn’t usually expect a beaver dam to be marked I was surprised this one wasn’t as it actually had potage signs to go around it. After the dam there was a long section of paddling through a windy river. After about 2km I reached the part where the river opened up into a swampy lake. At this point I could really feel the winds starting to pick up. It was difficult to get across the lake, which was only about 1km in length. Once arriving at the other side of the lake I found a spot along the left shore where I could pull over to have some lunch. Departing from my lunch break I had a solid 8km left to paddle to get to the Widgawa Lodge where my car was parked. Little did I know what I was about to go through on Charlton Lake. I had heard that the winds could get pretty strong on this lake but I figured that either way I could handle whatever came my way. The main lake had a consistent headwind that was slowing down my canoe significantly. On top of this consistent wind was the occasional gust that would pickup and take my canoe whichever way it wanted. If I didn’t have my canoe perfectly straight it would take me on a complete ride and spin me in the opposite direction. The only way I could successfully keep the canoe straight was to kneel in the center of the canoe. After being spun around a few times I had to pull to shore to take a rest. Being along in this wind was a bit of a frustrating experience. It took me a lot longer to get back to the launch than I had expected. At 1:30pm I finally arrived back at Widgawa Lodge. Ending a trip is never fun but this time I needed it. The final paddle that I had across Charlton Lake exhausted me and I had nothing left. It was also a great feeling knowing that I had finally completed my first solo trip, and it could not have been in a cooler place. 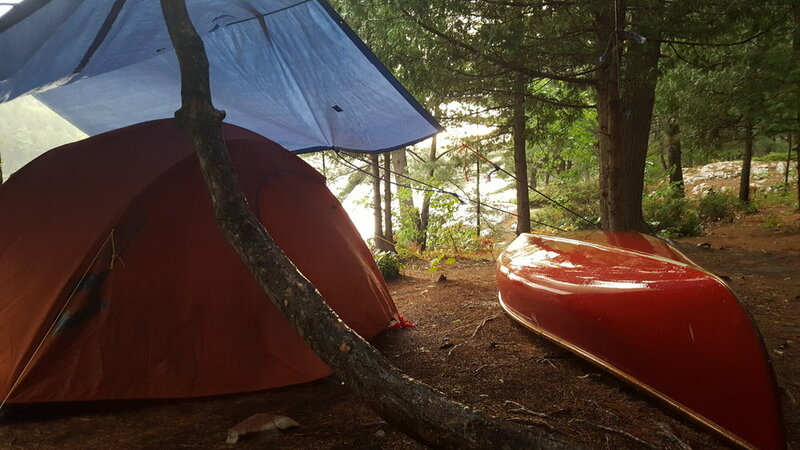 Killarney is one of my new personal favourite places to camp of the Ontario Parks group. 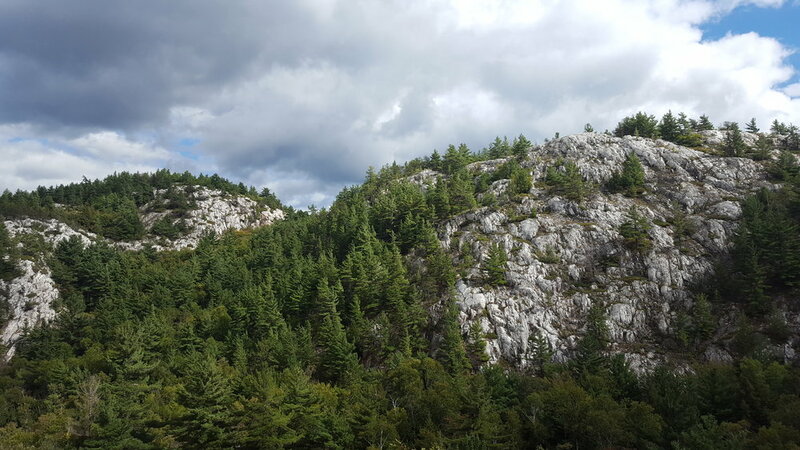 It features very unique scenery with large rounded white quartzite hills that dominate the landscape and straddle the La Cloche mountain rage. We did a 6 day, 5 night canoe trip launching from Bell Lake. Our nights were spent, in order, on Bell Lake, Deacon Lake, Balsam Lake, Harry Lake, and again on Balsam Lake on our way back. Highlights from the trip can be found in the video below! We arrived late on a Tuesday night and the park office stayed open an additional 20 minutes to wait for our arrival which was very nice of them. We had called to see how long they thought it would take us from Toronto as we had left late. Great group of guys who stay at a cabin across the lake and ran the park office at the Bell Lake launch (a job I wish I had). We had just enough time to get to a site that they happened to know was still available before dark. Bell lake was a pretty open lake that had some boat traffic on it, however it did have a nice view of the La Cloche mountain range. At the most north end of Three Mile Lake there is a 30m lift over into Balsam Lake that used to be used as a logging tramway. As you go through Three Mile Lake to get into Balsam Lake it begins to get more remote. Once you get into Balsam, there were many areas with heavy lily pad coverage and a few spots that proved to be very good for fishing! There is a small lift over going from Balsam into Deacon Lake (seen at 1:45 in video). Deacon was not the greatest for swimming, it is a little bit swampy although we still forced ourselves to go for a quick dip. The fishing on this lake wasn't spectacular but we did have some luck with a few small mouth bass. I did catch a really small bass using a top water lure and you can watch him hit it at 1:32. Balsam Lake however, had great swimming and fishing on it, and we were able to jump into the water from shore. From here we were able to do a day trip to David Lake which was absolutely beautiful. The portage from Balsam Lake into David Lake was only about 665m and made for a great day trip spot. Swimming was great and you should note that this is a lake that you cannot fish on. The clear blue water was amazing. You can see the cliff jumping in the video at 1:50. Getting from Balsam Lake to Harry Lake can prove to be a bit difficult but is well worth it for the fishing and swimming. Along the northeastern shore of Balsam Lake is a heavy lily pad/marsh area that you must paddle along the left shore quite a ways before seeing the very hidden portage sign. At this point there is a 400m portage that will take you into Pike Lake. This lake proved fairly difficult to get through as it was very swampy. It seamed there were large floating piles of mud that we would frequently get caught on and would force us to have a very windy path to the end of the lake. Here there was another portage about 705m in length taking you into Harry Lake. 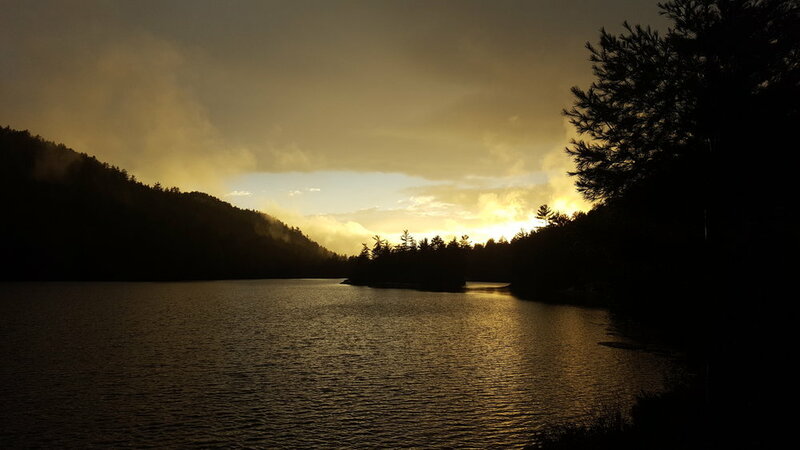 If you are doing a trip to Harry Lake and back out to Balsam again, I would recommend trying to stay 2 nights. It was a lot of effort to get into this spot and we all wished we could have stayed longer as the fishing and swimming were amazing. While swimming off our island site we happened to have a massive snapping turtle join the party but he wasn't looking to come after us. The last section of my video shows the fishing on Harry Lake (2:06 - 2:25). I would highly recommend a trip to Killarney. 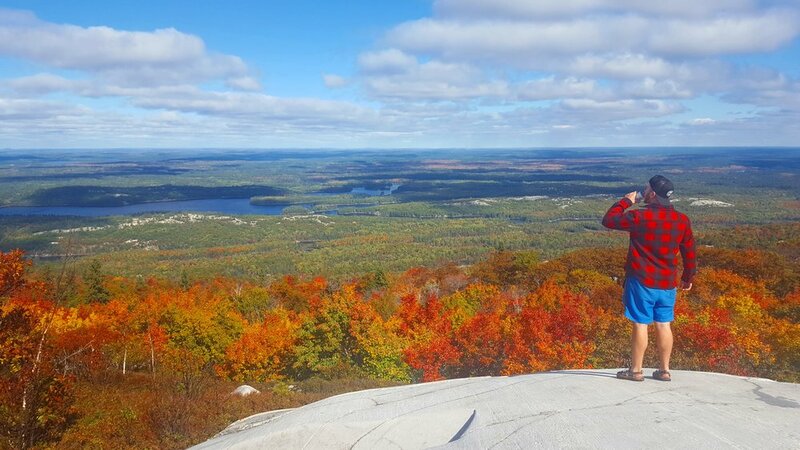 One thing that we were unable to do, but plan to do on our next trip would be to hike the La Cloche Mountains. There is a hike to a section called "Silver Peak" and another hike to "The Crack" that are both great hikes from what we have been told. This mountain range is over 3.5 billion years old and used to be higher than today's Rocky Mountains. Not quite as high anymore but it still offers a stunning view of Killarney Provincial Park.